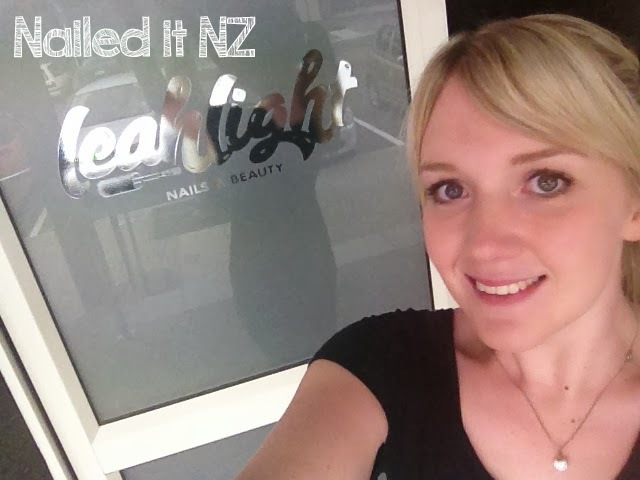 Nailed it NZ Meets Celebrity Nail Stylist Leah Light! Some of you may know that I have many wild and crazy dreams regarding my nail hobby. Most of them involve spending the rest of my life doing what I love - and preferably getting paid for it. A year ago I heard of the term "Celebrity Nail Artist." These people are nail stylists who are known for painting celebrities nails and/or who are celebrities themselves for their fabulous work. I quietly added this ambition to my long list of "things I want to be when I grow up" (yes I'm 23, shh) and left it alone, assuming I couldn't get to that level unless I moved to America. But then a few months ago, I heard of Leah Light. 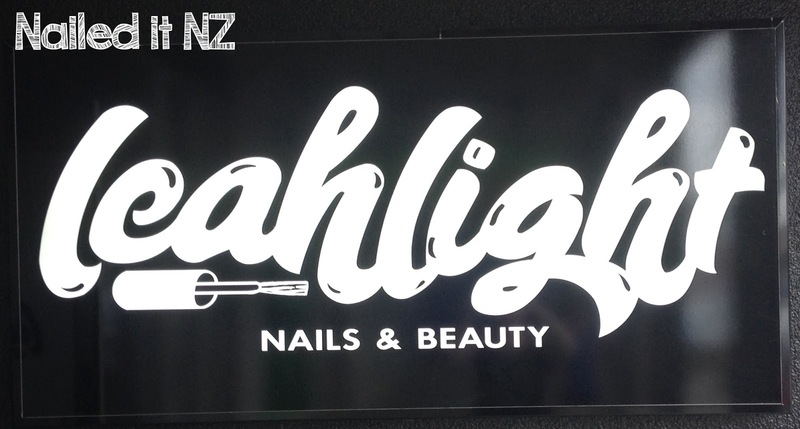 She's a nail stylist from Auckland and does all the local and international celebrities nails (Katy Perry, Taylor Swift, Rachel Hunter) when they're here - and she's a bit of one herself! I was suddenly set on meeting this woman. Considering I'm training in 2014, I wanted to get the best start possible, and she sounded like the perfect mentor! It was time to start entering competitions; I'm dirt poor and couldn't afford the plane ticket up there, let alone getting my nails done by her - so it had to be something I won. If you follow my blog, you'll probably know that I've had an amazingly high hit rate with competitions this year. I don't even enter that many, promise! Both the Marmite one and The Social Games I just saw advertised on Facebook or something; this one was the first time I had actively sought out a competition! I found a comp run by NewsTalk ZB and ASB Bank called "Sowing the seeds of Success." It was all about helping kiwis succeed, and I essentially got to choose the prize I wanted. I wanted to meet Leah Light! I excitedly entered, told my story... and promptly forgot about it. It's kind of what I do, so I don't feel let down when I don't win. However, it made for a very awkward conversation when a radio host rung me up at 7.50am and a) I didn't know who the heck he was and b) I wasn't sure what I had entered, let alone won. Honestly the most hilariously terrible conversation ever. This guy (Mike Hosking) was like "I'm Mike Hosking... Mike Hosking... Mike Hosking" and I'm just completely lost. I twigged on that I was on the radio after a while and then got excited when I heard Leah's name, but boy it was bad, but in a funny way. I meant to ban it to the depths of the internet, but because I fail at life I managed to post it to my personal facebook wall, which promptly got shared amongst friends and fellow nail addicts. Sigh. Anyway, all that really mattered is that I won! I was going to meet Leah Light! My plane tickets and my notebook full of questions to ask Leah! 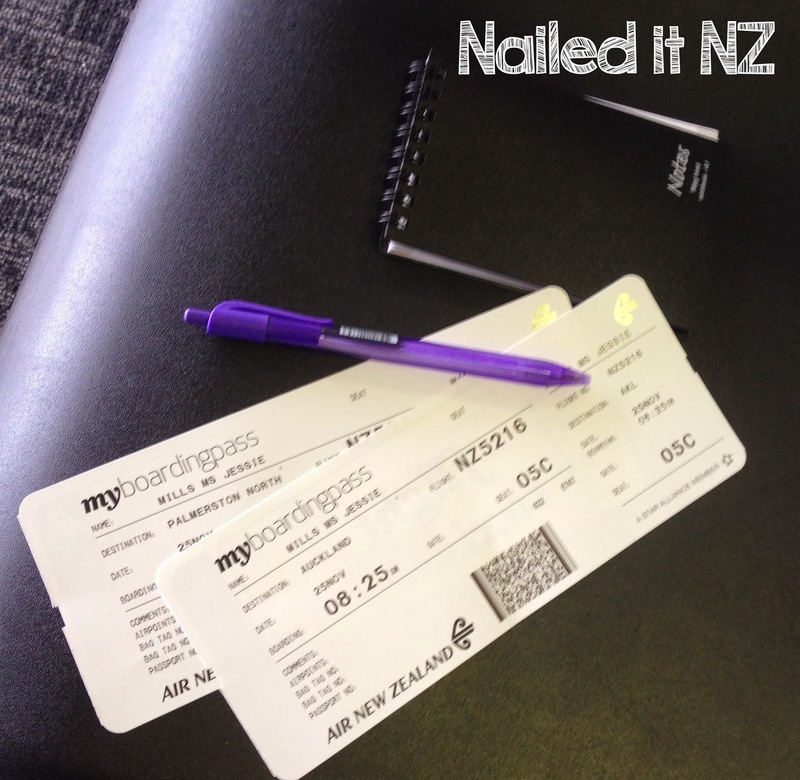 Three-and-a-half weeks later I was on the plane to Auckland. I was greeted and driven around by a lady from ASB called Sharon, who was just lovely! So friendly and talkative and helped quash my nerves☺. I ended up having three whole hours with Leah - I had so much to ask her and talk about, and we got along really well. Which was a relief, as I couldn't help but be worried we wouldn't get along - would have been a bit anti-climatic! I got my "nails did" and a glass of bubbles and heaps of tips and stories. To be honest, the best part was that we both have a terribly immature, somewhat dirty sense of humour (at least sometimes). She was so normal! And I met one of the girls who work for her too, Sophie, and she was awesome too! Here are the nails Leah did for me. Since she's seen my designs, Leah though that these might be a bit too plain for my liking but I loved them. What I wanted was to see her stuff; to try out gel polish and watch what she did. 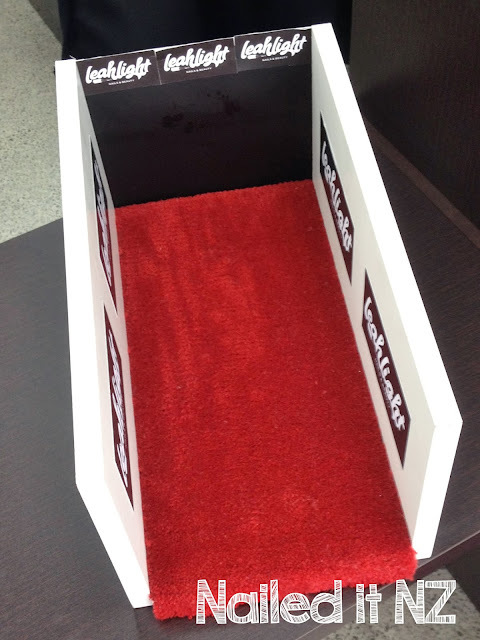 I hadn't actually given a though to what design I wanted - I was much to excited just to be there! Here's another reason I want a job like hers. The ladies from Mecca Cosmetica sent Leah a box of make up that I had been drooling over for ages! So cool. 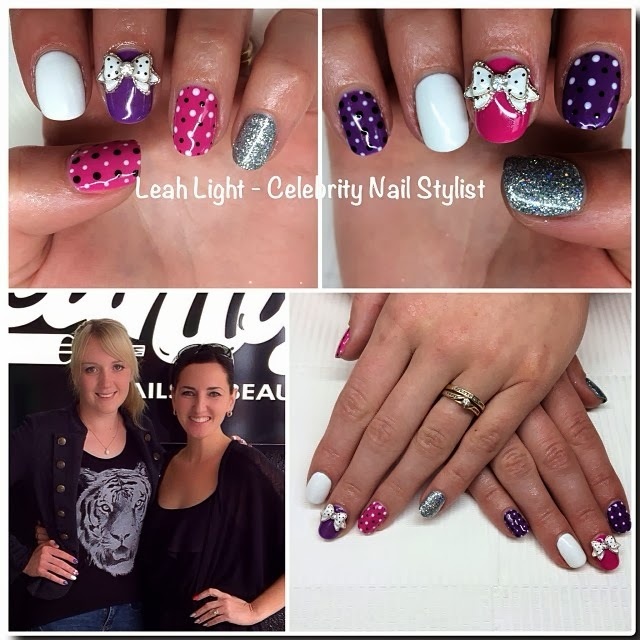 I had watched a few videos on Leah's website, and instantly recognised the nail runway that she has (there's actually another name for it but I can't think of it right now). I ended up walking my nails down that a few times! A quick snap of part of Leah Light's salon. On Leah's Instgram! 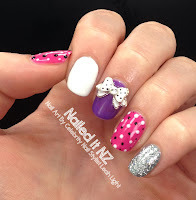 Add her - @nailsbyleah and me @naileditnz :). It was a really lovely day. I was so lucky to win such a fabulous competition and I just want to say thank you SO much to Sharon, Leah and of course my dear friend Mike Hosking for putting it all together. Got my eyes set on where I want to work in the future, now! I loooove Leah Light! You're one lucky duck to have gotten to meet her! Your nails look lovely! 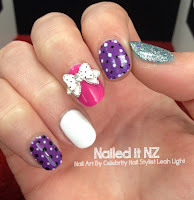 Hunger Hearts - Effie Trinket Nail Art! Peacock Pie Review - Butterfly Nail Polish Ring! The Winner of my KKCenterHk Giveaway!